BOOKS FOR A BETTER LIFE AWARD FINALIST at the age of thirty-six, on the verge of completing a decade's worth of training as a neurosurgeon, Paul Kalanithi was diagnosed with stage IV lung cancer. One day he was a doctor treating the dying, and the next he was a patient struggling to live. And just like that, the future he and his wife had imagined evaporated. When Breath Becomes Air chronicles Kalanithi's transformation from a naive medical student "possessed," as he wrote, "by the question of what, given that all organisms die, makes a virtuous and meaningful life," into a neurosurgeon at Stanford working in the brain, the most critical place for human identity, and finally into a patient and new father confronting his own mortality. What makes life worth living in the face of death? What do you do when the future, no longer a ladder toward your goals in life, flattens out into a perpetual present? What does it mean to have a child, to nurture a new life as another fades away? 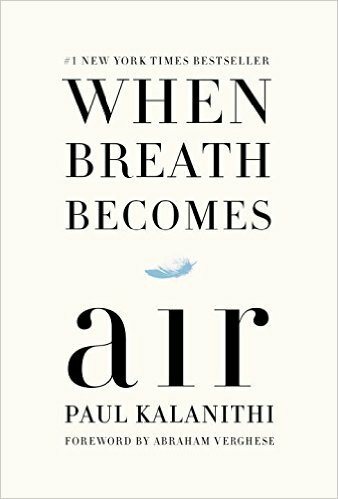 These are some of the questions Kalanithi wrestles with in this profoundly moving, exquisitely observed memoir. Send an iMessage on kibbitznest Facebook page to sign up.